(i) There are a range of recent examinations of where advertising is heading, including Accenture’s The Future of Advertising (PDF); a 108-page report from Credit Suisse, also called The Future of Advertising (PDF); and a slew of data and reports from IAB, the Interactive Advertising Bureau. (iii) The two top U.S. trade journals are Adweek and AdAge. The web has struggled with advertising since its earliest days. Keep in mind that the Internet was originally a U.S. government-financed network, intended for national defense. Nobody was thinking Yahoo! or Petfood.com when the Internet launched. Commercial forces overtook the Internet in the 1990s after the appearance of the World Wide Web, a media format that afforded display advertising, near-impossible to accomplish with a text-only network. The Wikipedia entry on Online Advertising determined that the “first clickable web ad was sold by Global Network Navigator in 1993 to a Silicon Valley law firm.” Since then it’s been a frenzy of banners, cookies, ad-blocking and billion-dollar acquisitions. The future of the web is now inextricably linked to the companies that figure out how to grab the most ad dollars. Some publishing media are not significantly dependent on ad revenue — for example books, most scholarly journals, music and computer games (although as you’ll see in the References section, advertisers are starting to get their mitts on games also). But just about every other form of publishing lives and dies by its ad revenue. Media thrives when it attracts the most ad dollars. And wouldn’t it be easy for our calculations if we could just look at total revenue. But the picture is far more complex. First of all there is “cost per viewer”: which medium offers the most viewers and the lowest cost per viewer? Even that is not enough: regardless of the cost of each pair of eyeballs, is the viewer motivated by the advertisement to make a purchase? Let’s call this “revenue per viewer,” be that a magazine reader, a web surfer, or a TV viewer. Obviously the more revenue that results from each ad viewer, the better the ad medium. There are two main reasons why certain readers/viewers can be motivated to purchase more stuff than another similar set of prospects. First is the quality of the creative itself: it’s as true as ever that “creative” makes a difference: great advertising motivates more activity than mediocre advertising. Next is the demographic of the viewer: matching the audience to the pitch. When selling fancy cars, advertisers want affluent readers and viewers. They’ll pay extra for those. Used car shoppers have little or no value to them. But this is just a small part of the Internet advertising story. Companies like Google and Yahoo! are rewriting how the business of advertising is conducted. They are as endlessly creative as they are compulsively greedy. There’s nothing they won’t try, and increasingly they’re trying to horn in on traditional advertising revenues, complementing those with their own unique reach. This is having a seriously negative impact on a lot of other media companies. 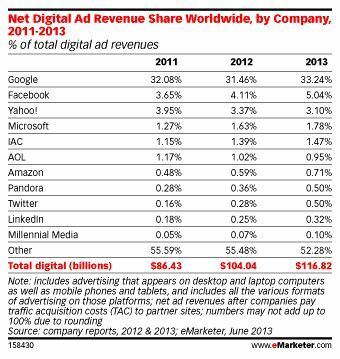 It’s interesting that while Facebook gets more traffic Google dwarfs it in advertising revenue. The larger battle is over the new breed of “agencies” that in many cases control the advertising that appears on these sites, taking a healthy cut of the action along the way. DoubleClick was the highest-profile agency until its purchase in March 2008 by Google for $3.1 billion. Another large player was TACODA. The New York Times announced recently that it would shift away from its subscriber-based model to an ad-based model. Here is one of the most valuable media properties in publishing changing its tune, and perhaps signaling a new tune for us all. This announcement appeared while Rupert Murdoch was in the midst of negotiations to acquire Dow Jones, including the Wall Street Journal, since successfully concluded. There were immediate rumors in the press that while the Wall Street Journal remains a model for the successful integration of print and online revenue models, Murdoch would consider opening up the site to more free viewing. Then on November 13th, although Murdoch had yet to take formal ownership of Dow Jones, he told reporters “We are studying it and we expect to make that free, and instead of having one million, having at least 10 million-15 million in every corner of the earth.” The New York Times reported that “The Web site, one of the few news sites globally to successfully introduce a subscription model, currently has around one million subscribers, which generates about $50 million in user fees.” (Apparently an understated number, as the minimum price for an online-only subscription is $79/year, with renewals at $99/year.) An October 1, 2007 article in the Information World Review revealed that the Financial Times (of London), “has stopped short of full free access to its content (but) FT.com is to introduce a new 30 free views a month system to increase access to the site.” One category of periodical that is paying particular attention to the Web is fitness and health. According to a September 17, 2007 article in the New York Times, “Publishing companies are also following the movement of health ad dollars to the Web. Web display advertising for prescription drugs has increased nearly fivefold in the last four years, to $163 million last year, according to TNS Media Intelligence. 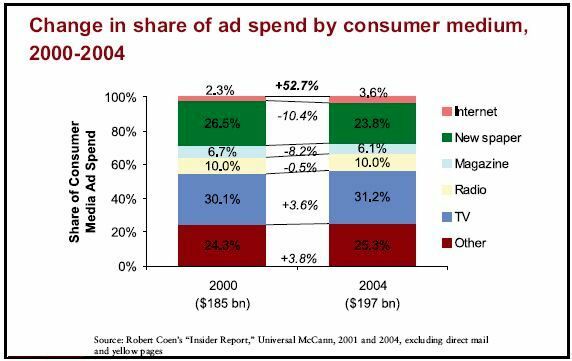 That is still only 6 percent of drug ad spending on television and less than 10 percent of spending on magazines, but it has passed drug advertising in newspapers.” Another category is business-to-business (B-to-B) periodicals. As you’ll read in the section on Magazines, CMP now sees non-print revenue exceeding print. This is but one example of the advertising shift in a portion of publishing industry. Almost three-quarters (72%) of all consumers read magazines, even when the same content is available online. Conclusion: What is the Future of Advertising? It’s clear that there are numerous instances where the Web is starting to make significant inroads into advertising revenue from most publishing media, and not just print. It’s equally clear that the percentages remain modest, as does the overall percentage shift. Each publishing medium reflects distinct characteristics and advantages that sets it apart from other competing media. In some instances the Web can provide tangible advantages over certain aspects of certain media, but rarely can it outdo a specific well-established medium in all of its aspects. Consumers tend to default towards choice. They want more, not less. As long as they can balance time and budgets against available choices, the multiplicity of media available today will continue to exist for the immediate future. The competition for ad dollars will, as it always has been, remain fierce. But there is still a lot of cash available to support a range of media, even while business models change and publishers are forced to make some difficult business choices. 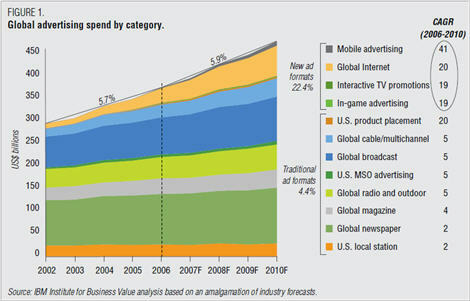 The chart below well-illustrates the conundrum that traditional advertising faces as it confronts new media. 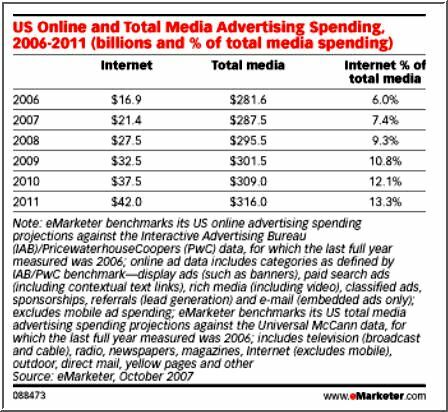 1.The Stats (a) “The Decade in Online Advertising” (PDF file) mentioned above, published in 2005 by the no-longer-independent Internet ad firm DoubleClick, provides some perspective on the duality of Internet advertising. On the one hand the growth has been enormous; on the other hand, it still amounts to only a small fraction of U.S. ad expenditures. To read the news these days you could easily get the idea that the Internet dominates all advertising. The reality is far different. (b) The IAB Internet Advertising Revenue Report is an industry survey conducted by PricewaterhouseCoopers and sponsored by the Interactive Advertising Bureau (IAB). Published semi-annually, the latest version was published in May, 2011. (c) A View to the Future eMarketer.com is focused more-or-less exclusively on sales reports and sales projections, and so of course is willing to go out on a limb with its projections of Internet advertising spend. Things do clip along for the next few years, merely doubling by 2009. 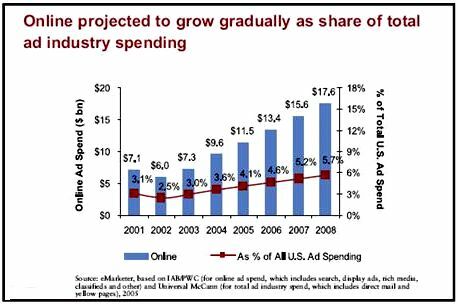 But unless all other forms of advertising remain static in volume during that period, Internet advertising will still only represent about 13% of all U.S. advertising expenditures by 2011. I write this not to be negative. The numbers are remarkable. But we have to keep in mind that the Internet, while heavily influencing the show, is not yet running it. As per the example above, DoubleClick does offer what strike me as relatively unbiased and in-depth research reports for free on its website. Also available are case studies and a very-poor and infrequently-updated blog. They say that Google has no trouble attracting the best and the brightest, and I see they’ve hooked Hal Varian.” Mr. Varian is a very well-respected professor in the School of Information, the Haas School of Business, and the Department of Economics at the University of California at Berkeley, who is “currently on leave from Berkeley and…serving as Chief Economist at Google.” He is the author of numerous articles and scholarly papers and one of the key authors of the famous study, “How Much Information? (which I reference in my section on the Information Explosion). This blog entry from Mr. Varian provides a straightforward explanation of the somewhat complex procedure of how advertising is priced at Google and several other search engines.